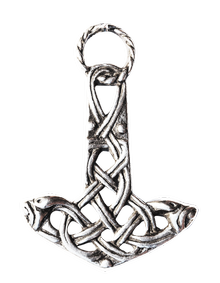 Crafted in English pewter, with a matching 18” link chain. 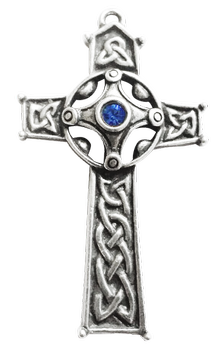 Handed down from Leodegrance to his daughter Guinevere on the occasion of her marriage to King Arthur and then given as a secret Love Token to her champion Lancelot, this unusual cross is reputed to enable its wearer to find and embrace True Love. 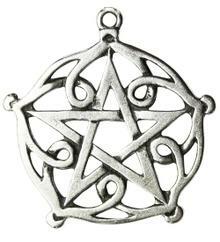 Incorporating the Celtic signs for Spring, Summer, Autumn and Winter, this equilateral cross was worn to balance the Elemental Forces and is worn for Season Grace. 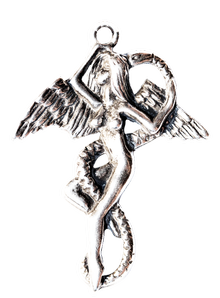 Entwined with her Serpent, Eve symbolises the creative essence of Feminine Energy, manifesting the intuitive qualities of Woman. 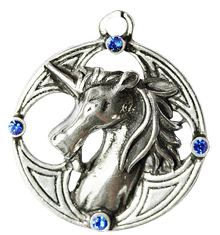 This Talisman is reputed to bestow upon the wearer the benefits of Intuition and Inner Strength. 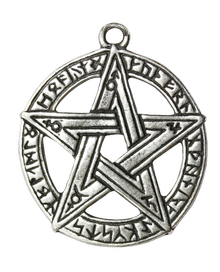 Wrought by Earth Spirits and given to the Viking Goddess Freya by the Aesir of Odin, this pentagram is reputed to bestow upon its wearer irresistible Beauty and Charm. A direct descendant of King Niall, St Columba encountered the Loch Ness monster, which rudely swallowed one of his followers. St Columba spoke to it so forcefully that it appears to have been in hiding ever since! 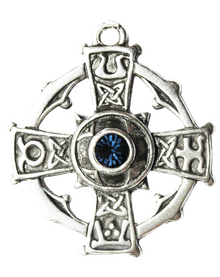 St Columba’s cross is reputed to bestow Fearlessness on its wearer. Brigit was the Sun Goddess known in Ireland as “Bride of Golden Hair” and in England and Wales as “Bride Goddess of Marriage”. 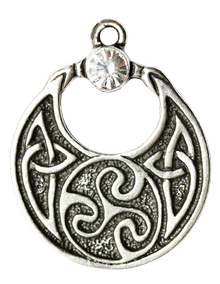 As the Celtic Goddess of Light and Spirituality her Amulet is worn for manifesting and nurturing your own Inner Light. A Predecessor of King Arthur, Ambrosius Aurelianus the wise High King who bravely defended the West from the onslaught of the Saxon Hoards. 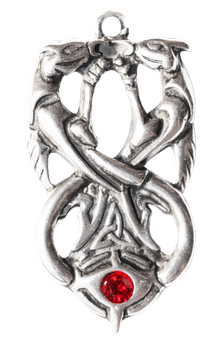 This pendant is worn for Strength And Wisdom. 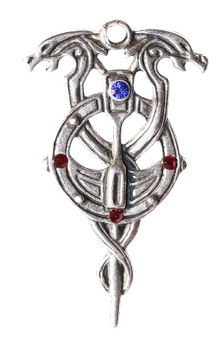 Decorated in Odins bindrune spells, this sword is reputed to guard and protect the wearer’s Body and Soul, Hearth and Home. 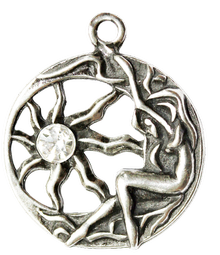 The Great Skalds (Poets) found inspiration in the elements around them and from the Earth’s wisdom. 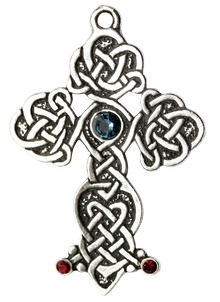 This amulet featuring Futhark Rune inscriptions representing the poetry of Nature aids those seeking Creative Inspiration. 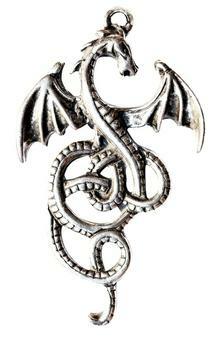 Nidhogg, the Viking Serpent of Immortality thrives in the dark Underworld of Niflhelm. 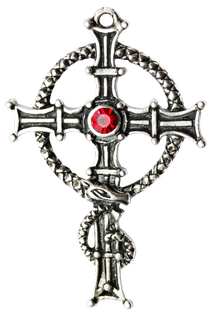 This pendant is reputed to bestow upon the wearer the ability to resolve difficulties and to Survive and Triumph Through Troubled Times.